We are always on the lookout for models that make great trainers and in many ways, the Ares Advantage Decathlon 350 is the ideal airplane for learning to fly RC! This attractive looking sport scale model uses technology to assist newer pilots develop proficiency. Ares’ Aegis Natural Flight Progression (NFP) system uses three different flight modes (beginner, intermediate, and unassisted) to provide varying levels of stability assistance. 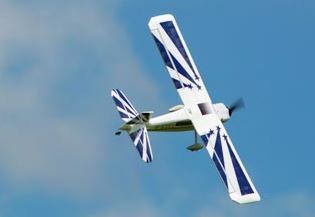 Beginner Mode limits the bank angle during flight and automatically helps pilots make coordinated turns. Intermediate Mode allows greater bank angles and helps a pilot to learn that using the rudder effectively can enhance the overall control of the model. In both of these two modes, releasing the the sticks causes the Decathlon to quickly return to level flight. Unassisted Mode disables the NFP system but if a pilot finds themselves in trouble, they can instantly reactivate it by returning to Beginner or Intermediate mode. With the NFP system active, takeoffs and landings automatically become straight, smooth and stress­-free. 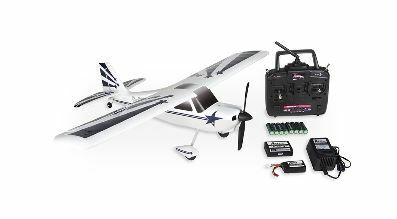 The Ready to Fly (RTF) version even includes a standard size 2.4GHz six channel transmitter, flight battery and charger. The Ready for Receiver version does not include these items or a receiver and is for pilots who may already have these items in their hangars. Wing Area: 152 sq. in. For more information , click over to Ares RC!